I'm back from my Caribbean adventure and needless to say, it was much, much fun. So great it was in fact, that I've been considering relocating. Probably not realistic but a girl can dream, can't she? Hope that you all enjoyed Vicky's lively posts about the Brooklyn Bowl and The Creek in LIC. I know that I'm curious about both venues and hope to check them out soon. Curry Conch Platter - The first time that I tried conch was in the Bahamas and I immediately fell in love with it--presented in fried form, it was easy to fall for. For those of you unfamiliar with conch, it's a type of shellfish that comes from a sea creature with a hard shell, not unlike one that you'd find on a beach. The conch that I ordered was curried and came with abundant side dishes such as brown rice with peas, a traditional potato salad (similar to what we make in Eastern Europe) and a leafy green and tomato salad. 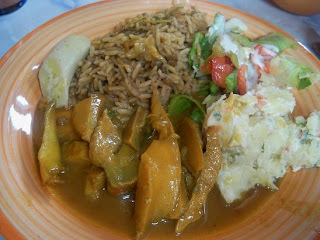 I enjoyed the whole plate and especially the conch, which was a tad slimy but still very delicious, flavored by a smoky, lightly spicy curry sauce. Each bite sent a rush of flavor to my senses, and when I needed a break, I took a bite out of one of the more milder sides. Slow Cooked Spare Ribs - Dan ordered this as his main dish and loved it. I did too, and agreed that he won the prize for best entree choice. The spare rib meat was incredibly tender and flavored by a thick beefy sauce that was rich and comforting. Dan loved the hearty Caribbean seasoning of the meat so much that he licked the bones clean. As far as the sides, they were the same as mine and he liked those too. Drinks - We rounded out our Caribbean lunch with two interesting drinks. 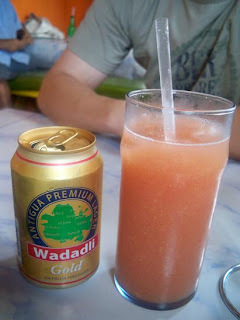 Mine was a more homemade choice with fresh guava juice and Dan went for the local Wadadli beer. I had a strong preference for the guava juice, as it was sweet (but not overly so) and had tasty little bits of guava in it. The light pink color was gorgeous and went hand-in-hand with our exotic surroundings. 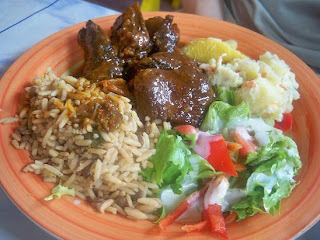 We were helped by a duo of Antiguan women, one of them the cook and the other the server. Both were cheerful, polite and explained the dishes to us in an enticing way. We felt safe in their hands, immediately seeing that their little restaurant was a labor of love. This delicious food could not come at a better price - two entrees, and two drinks set us back $17 U.S. total. What a deal - and it certainly filled our bellies. Although I don't think this restaurant had a name (it was a small hut), it's located off the main road in Falmouth Harbor, Antigua. Looks like plates I used to enjoy in Brooklyn; esp. rice and peas. I'm not a big conch fan, but would be willing to try anything in curry sauce. I tried lizard in Honduras, and it was very tasty when I could put its lizardy-ness out of my mind.